According to Gen. ii. 9, there stood in the midst of the Garden of Eden a "tree of life," apparently by the side of the "tree of knowledge of good and evil." Although Gen. iii. 3 seems to presuppose but one tree there, Gen. iii. 22 asserts that, after the primitive pair had eaten of the tree of knowledge, they were expelled from Eden lest they should put forth their hands and take of the tree of life and live forever. 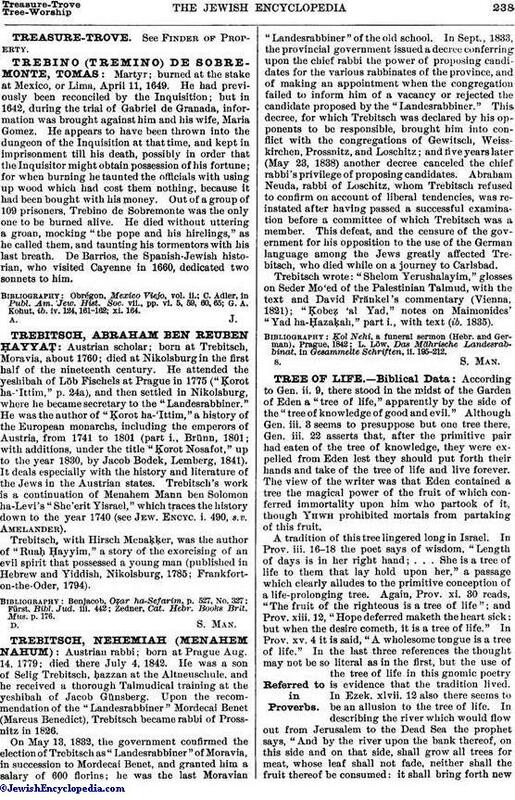 The view of the writer was that Eden contained a tree the magical power of the fruit of which conferred immortality upon him who partook of it, though Yhwh prohibited mortals from partaking of this fruit. A tradition of this tree lingered long in Israel. In Prov. iii. 16-18 the poet says of wisdom, "Length of days is in her right hand; . . . She is a tree of life to them that lay hold upon her," a passage which clearly alludes to the primitive conception of a life-prolonging tree. Again, Prov. xi. 30 reads, "The fruit of the righteous is a tree of life"; and Prov. xiii. 12, "Hope deferred maketh the heart sick; but when the desire cometh, it is a tree of life." In Prov. xv. 4 it is said, "A wholesome tongue is a tree of life." In the last three references the thought may not be so literal as in the first, but the use of the tree of life in this gnomic poetry is evidence that the tradition lived. In Ezek. xlvii. 12 also there seems to be an allusion to the tree of life. In describing the river which would flow out from Jerusalem to the Dead Sea the prophet says, "And by the river upon the bank thereof, on this side and on that side, shall grow all trees for meat, whose leaf shall not fade, neither shall the fruit thereof be consumed: it shall bring forth newfruit according to his months." In the New Testament, where this passage is quoted (Rev. xxii. 2), the tree is described as the tree of life. In the extracanonical literature there are two or three additional references. The Ethiopic Book of Enoch (xxiv. 4) describes the tree of life as having "a fragrance beyond all fragrance; its leaves and bloom and wood wither not forever; its fruit is beautiful and resembles the dates of a palm." The Slavonic Book of Enoch (viii. 3) says, "In the midst there is the tree of life . . . and this tree can not be described for its excellence and sweet odor." IV Esd. viii. 52, in describing the future, says, "Unto you is paradise opened, the tree of life is planted," etc. Budde ("Urgeschichte," pp. 46 et seq.) showed that in the original narrative of Gen. ii.-iii. there was but one tree. This, he thought, was the tree of knowledge, and he accordingly eliminated the tree of life. Barton, however, has shown ("Semitic Origins," pp. 93 et seq.) that in primitive Semitic life the especially sacred tree was the datepalm, and that, because of its bisexual nature and because of a belief that man came to self-realization through sexual relations, it was regarded as both the tree of knowledge and the tree of life. The differentiation which divided these functions between two trees came in at a later time, when knowledge of the origin had become in part obscured. That this is the source of the idea of the tree of life among the Hebrews is rendered probable by the following considerations: (1) the Temple of Solomon, which was evidently intended to imitate a garden (comp. Bevan, in "Jour. of Theol. Studies," iv. 502 et seq. ), was carved with cherubim, palm-trees, and flowers (I Kings vi. 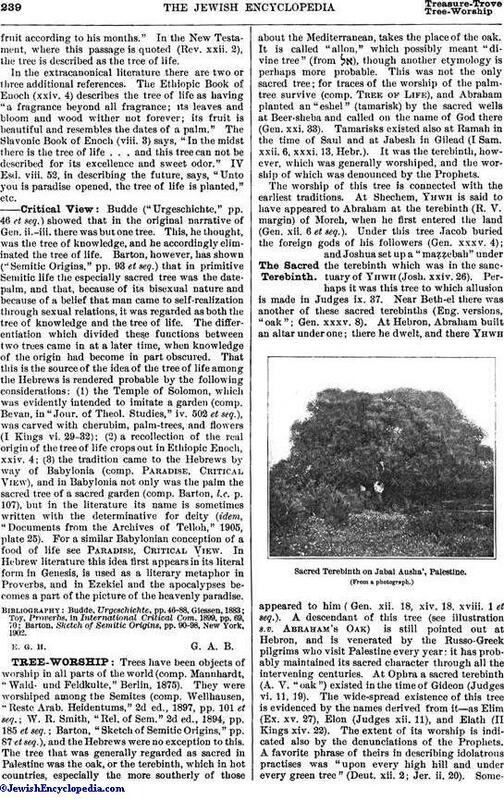 29-32); (2) a recollection of the real origin of the tree of life crops out in Ethiopic Enoch, xxiv. 4; (3) the tradition came to the Hebrews by way of Babylonia (comp. Paradise, Critical View), and in Babylonia not only was the palm the sacred tree of a sacred garden (comp. Barton, l.c. p. 107), but in the literature its name is sometimes written with the determinative for deity (idem, "Documents from the Archives of Telloh," 1905, plate 25). For a similar Babylonian conception of a food of life see Paradise, Critical View. In Hebrew literature this idea first appears in its literal form in Genesis, is used as a literary metaphor in Proverbs, and in Ezekiel and the apocalypses becomes a part of the picture of the heavenly paradise. Barton, Sketch of Semitic Origins, pp. 90-98, New York, 1902.